When will the “age gateway” retire? Smashing Magazine has an entertaining piece on the Unusable and Superficial World of Beer and Alcohol Websites. The “age gateway” was a topic I wrote about a year ago and I’m glad to see others chime in on the sheer futility and stupidity of the device. I mean, really, does this little gateway really keep out the underage? Or does it simply load up a database with millions of people born on 1/1/>21 years? I don’t believe there was any Supreme Court ruling that mandated age gateways, was there? No. I think it was lawyers at one or two large breweries that got this thing started. And the rest of the alcohol producers just followed along. Better to be safe than sorry right? That is, until one of the breweries removes the gateway — or vastly simplifies it — and doesn’t get sued. And, more important, get significantly higher numbers of repeat visitors. I’m already seeing signs of alcohol producers simplifying the gateway. As the Smashing Magazine article notes, there is the age gateway of Christiania Vodka which simply asks Are you over 21 years of age? Users click Yes or No. And sure to be copied by others. The lesson here is to be careful what “standard” design elements and gateways you choose to replicate on your site. There are design standards of course, such as the ubiquitous shopping cart icon, which we can safely assume that consumers are well accustomed to using. But not all design elements should be replicated. 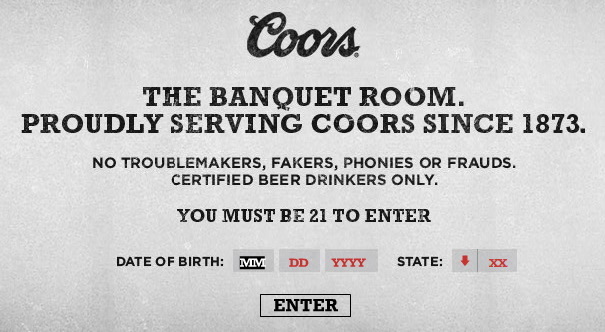 Just because the major breweries all require users to painstakingly enter their dates of birth does not mean this is a best practice. I predict that a year from now we’ll see a dramatic shift towards the more user-friendly Yes/No model demonstrated by Christiania Vodka. Best practices sometimes emerge from the fringes. I’ve seen similar trends in web globalization. Google, for example, was the first company to openly solicit volunteers to help it localize its web site — way back in 2002. Today, it’s safe to say that translation crowdsourcing has gone mainstream. The 2010 Web Globalization Report Card is now in development. It will be interesting to see what new trends — both good and bad — have emerged and are still emerging. So true! That gateway is pointless anyway, why does it have to be so complicated, asking for your exact date of birth? As if that would make lying harder.